The Angriest: Yowamushi Pedal: "To Recruit More Members"
It is 14 October 2013, and time for episode 2 of Yowamushi Pedal. Having seen Onoda's freakish abilities at cycling uphill, Imaizumi challenges him to a race: from the town below the school all the way around to the steep rear entrance. To give Onoda a stake in the race, Imaizumi promises to join Onoda's anime club if Onoda wins the race. Hearing of their contest, Miki organises a group of friends to watch and cheer the cyclists on. There is good and bad in this second episode of Yowamushi Pedal, but it is mainly good. The series continues to impress with its immensely likeable characters and great sense of humour. On the other hand, the effectively slow pace of the episode - the race begins but does not end here - suggests, along with the episode count lying ahead, that this is going to be a very stretched-out kind of a series. While I am concerned my patience may not last, given I'm notoriously slow and lazy at finishing anime, for now its immense charms are keeping me watching. There are a few things I really like here. I like that the series is not ridiculously unbelievable. Onoda is great at riding a bike with a huge amount of natural talent, and he even surprises himself here at just how fast he is going, but at the same time he lacks the training that Imaizumi has and is ultimately outclassed. That's a really good thing to see: no one wants a series where the protagonist is perfect straight out of the gate. There is room to grow now. I also continue to like how the series has made Onoda an anime enthusiast without diminishing or ridiculing him. He is scared of ridicule, but these new schoolmates that he getting to know are in the main not mocking him at all. I am also really getting to like Miki, whose family owns a bike shop and whose technical skills in seat placement help Onoda along in his race. There's a nice moment of technical detail in that. Much as Tsuritama would drop in actual techniques related to bass fishing from time to time, here Miki's rationale for shifting the saddle of Onoda's bike has a logic and an explanation. I hope this sort of detail continues as the series goes on. It is also nice to see a female lead who is, for now, practical, smart and not a romantic interest. There is a great sense of motion in the animation as Onoda and Imaizumi race. CGI is clearly used, but there is still a strong element of traditional animation about the characters themselves. There is clearly a limit to the series' budget, as the odd shot can look a bit limited or weirdly drawn, but in the main it is very bright and appealing. 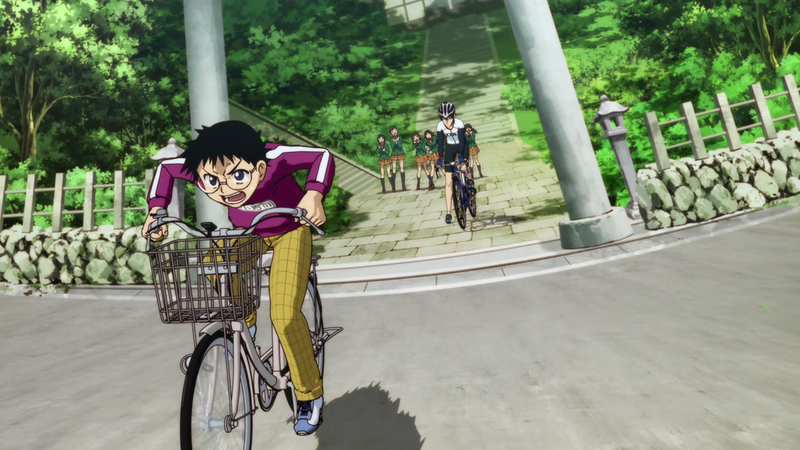 The episode ends with Imaizumi well in the lead, but Onoda recharged and driven to win the race. We are running two for two in the quality stakes so far, giving Yowamushi Pedal a perfect quality ratio of 100 per cent.